Friday fabric day again. I have so many things I could blog about today. There is so much going on. Thank you to everyone's sweet comments about my patterns and for buying them! I've had a really nice response and it's very exiting for me. Especially since today on Quilting Fiesta, there to my surprise was an 'All Dressed Up Dress, appliqued by the very talented Betsy. How is that for quick! And Betsy hasn't been hand appliquing very long. Thank you Betsy! Don't you love this summer in the city fabric - that you can really no longer get! Well, actually I tried to get the blue birds on brown above many times when it came out but every store I checked was either sold out or didn't get it in. I loved this fabric line so much that when I saw a darling bag made by Cassie, I posted to her my story of fabric woe and and down right jealousy! Cassie is a talented, sweet person and she, to my joy and surprise, sent me a package of fabric and shared with me!! I was so excited to get it and I've been admiring the fabric on my table since it arrived. Cassie has a great blog. I loved her tutorial for binding. She's made some lovely projects and has darling things in her Etsy store. Some lucky girl snatched that bag from her shop already. Thanks again Cassie. Love the fabric. 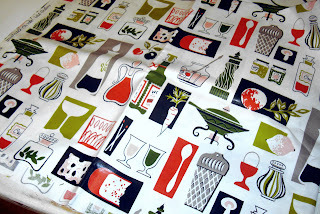 My sister Michelle gave me this amazing this vintage kitchen novelty fabric several years ago. It belonged to her mother-in-law and was in a closet just waiting for me to treasure it. I have a bigger piece and several small pieces and I've used it in several projects so far. It is one of my all time favorite vintage fabric patterns. Lovely isn't it. 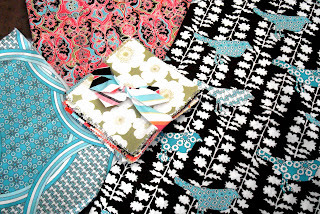 These are some past Japanese fabrics I bought at Etsy a while ago. I love the little sticker on the fat quarters. I hate to take it off and cut them because they look so cute just as they are. Some more lovelies that were past Etsy purchases. I have plans for them, of course, but they are worth dreaming about a bit more before I cut into them. So now goes the "stuff" part of my post. This is a quilt top above made by Jill. Jill emailed me a while ago with some quilting questions and I don't know how much help I was other than encouraging her to finish this 10 year old project. And here it is. I'm always really happy to help beginning quilters and it made me happy when she sent this picture to me of the finished project. I love to see unfinished projects see the light of day. Now she needs to get it quilted. One more step Jill. I'm feeling like a proud mama today when I look at the montage of blocks from Terri's post today. I've been surfing around looking at blogs belonging to our exchange and really enjoying the cottages popping up all over. I'd mention each blog individually but I can't start that - there are nearly 50 of us in the exchange! Not to mention Belinda who isn't in the exchange but wowed me with her cottage. I received some pictures from one of our sweet non-blogger exchange girls and we'll add those to the montage for next week. They are darling. Sarah made the suggestion of fall or Halloween cottages and it was all I could do not to run, not walk, to my fall fabric. Oops, there now I've started to name names and I wasn't going to do that. And the world's best neighbor, Laura, brought us yet another amazing cupcake from her kitchen -Lemon meringue with real meringue frosting and lemon inside. Beautiful and delicious! Ok so I'm still not caught up with blogs or even my day job today but I'm making progress. Have a good weekend everyone. Thanks for all your sweet comments and support. Lovely blue and yellow qult.... wish my old UFO's had such pretty colors. Mine are definitely dated by the era started. Wow, what a post! I love all the fabrics, quilt tops, and especially the cupcakes. Mmmm I just want to reach into the screen and take one and eat it! I love the quilt top too. The cottages are amazing and I have been seeing them on quite a few blogs as well. Impressive. Great kitchen print, love that! 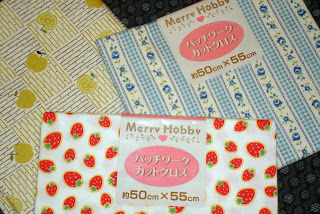 And the Japanese fabrics are so cute. 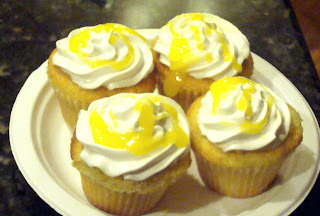 I love the vintage fabrics and the Japanese charm packs...and the lemon meringue cupcakes look delicious! That fabric that was someones mil's takes me back to the 60's. How fun. Love the black/white/blue birds. I so get your comment about "dreaming" about your new fabric before you cut into it. Sometimes I have trouble cutting into a piece of fabric because I don't want to spoil its potential. It's good to know I'm not the only one. Lovely post, Nanette. Thanks for including me. I wish I could taste those cupcakes. They look divine. Lots of goodness in your post. My very favorite is the wonderful kitchen fabric. Ooo and aah. I jumped over to Belinda's and oh my gosh how I love her cottage. The roof is amazing. Your Fabric Fridays are so wonderful. I know what you mean about not wanting to take the sticker off of the Japanese fabrics. They do such a cute job of wrapping everything, I sometimes don't even want to undo the tape holding the package together, because even their tape is decorative. GREAT post..a whoo and a hoo!!!! Love your new patterns, and all the wonderful fabric that you showed. The vintage fabric, so cute. The montage of cottages is very, very nice...and oh no, Fall Cottages!!!!! Yummy looking cupcakes also :-)! I love your blog and all the wonderful things you say and make. What a great idea for the vintage towel. You know I too love fabric but God I hate cutting into it. I always want to save a bit of it too. Another good FFF; I love the inspiration I get from YOUR stash. Lately I have been looking at fabric with your cottage block in mind. What are you doing to me?!! LOL. The cottages look lovely! I also love the summer in the city fabric. I have some that I hate to use, I love it so much. I also love your vintage kitchen fabric - it always makes me feel so good. That kitchen fabric is to die for! I wouldn't know what to do with it though. Love seeing these cottages popping up on blogs! Let's have a moment of silence for Summer in the City. You have every reason to be proud! Lots of beautiful things to show and talk about. Good work!! I love those little Japanese charm packs!! As much as I love your FFF it sure does get me in trouble lol!!! thank you nanette for flagging my cottage as a "look see"....i've had several comments about the roof fabric....it is vintage from my grandmothers stash i inherited...it's quite possible 60 yrs old or older.....i can't wait to see all the different cottage ideas that will be popping up. I never had (or saw, that I knew of) the summer in the city fabric line. it looks awfully cute. I do wish that some of the fabric lines would stick around just a bit longer. wouldn't that be nice? Ok first off where is that neighbor of yours cause I'm wanting some of those cupcakes!!! I love those houses I've got to get busy making some. I see them all over blogland. WOW Nanette- What a fun and pretty post. I would never open those little packets either! Too cool. So glad you got some of the black and aqua fabric. Aren't bloggers just the best?! Thanks for all the pics. Love your site and your patterns. I also write patterns for quilt classes I teach and it is the hardest part for me to get the illustrations to go with the writing. I also have not done much about marketing, though a couple quilt shops are carrying one of them, so maybe that is a start. But it sort of happened accidently!!! Beautiful, wonderful fabrics once again! How sweet of Cassie to share with you. I love the house block montage - what a great idea! 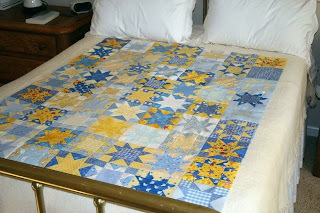 How wonderful you helped Jill finish her quilt top - it is so pretty! She did a great job on it! I hope you have a chance to catch your breath, and take things easy now. You have the most fun fabrics of anyone I know. Love when you post pics of it. Oh my goodness please pass a cupcake - YUMMO. It will give me strength so that I can order one of those cute dress quilt patterns. YAHOO I'm so excited. People already have cottage blocks done??? :0 Super seamstresses! 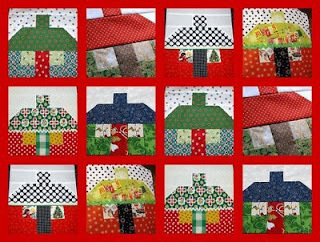 Quick Quilters! Ohhhh, fall cottages! Spring Cottages! Summer Cottages!! 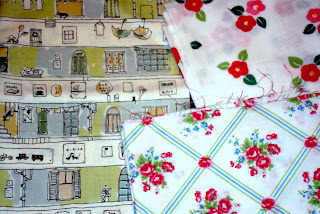 I am lovin' that Summer in the City birdy fabric. 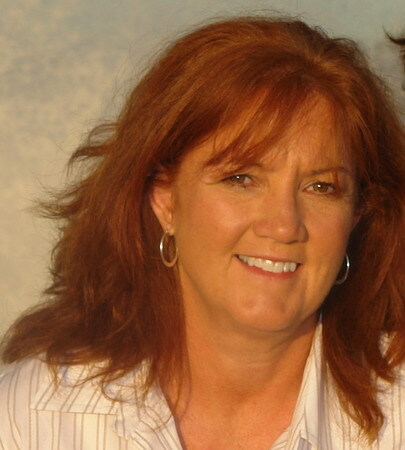 I think that was before I was back into quilting and stalking new fabric images daily. Missed that one. Ohhhhhhh, those cupcakes look good! It is a good thing I dont' have a neighbor like that. That vintage fabric is SOOO COOL! Wow -- all that wonderful fabric is amazing. But those cupcakes!! They just look so incredibly delicious!